Kids Church is a place that provides a safe, loving, and fun environment for children to learn about Jesus, God’s Word, and His unconditional love for each and every one of them. Our focus is to lead children into a relationship with Jesus and to experience His love and presence in their lives. Your children are so important to us! We have loving and trained volunteers and staff ready to interact with the children at each service. Youth Group is a time for teens in 6th-12th grade to come out and experience food, fun, and faith. We are committed to positioning teens to have a real, life-changing encounter with Jesus. Being a teen is a time when one should have a lot of fun but also develop a faith in Jesus that carries into adulthood. With age-appropriate games, snacks, worship and prayer, teaching and discussion, we are intentional about speaking to the issues that most teens are facing. Through this, we strive to give teens real-life solutions based on faith in Jesus to be able to navigate the difficulties of this season of life. For any questions about our Youth Group or for more information, please email Thomas McKellick. 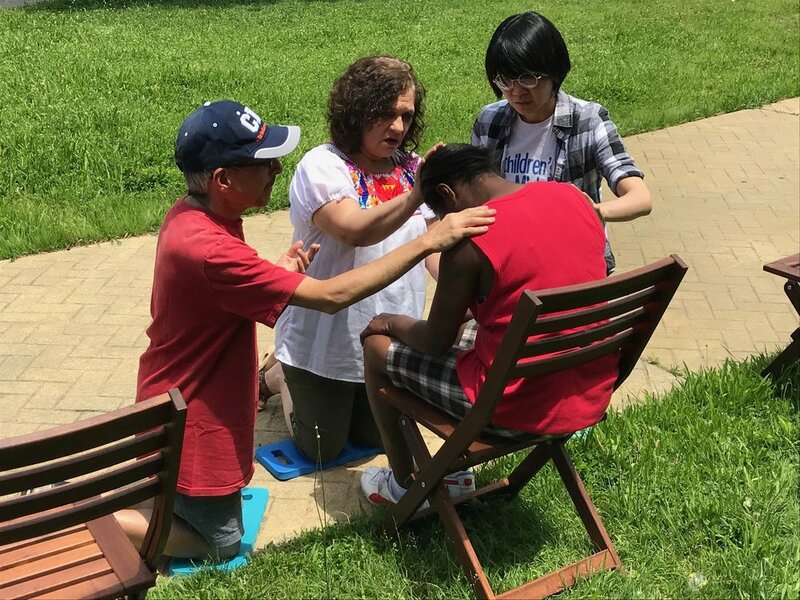 Healing on the Streets (HOTS) is a very simple and effortless way to reach out to the lost and hurting on the streets, enabling us to connect with a particular community and powerfully express God’s love to those we meet. We simply invite people to sit in the chairs that we provide so we can pray for them. Our part is easy! God does the work, and it's amazing to be able to partner with the Holy Spirit in this way. We have seen such tremendous, life-changing encounters with Jesus -- when the Church gets out of the building and onto the streets, when lives and communities get the chance to experience the Kingdom and encounter Jesus! Jesus has called us to continue his supernatural ministry. He promises the same and greater works to those who will pick up this charge. We are on a journey of learning to see who we are in Jesus and live through Him to the world around us. We will train you to live a naturally supernatural lifestyle, right where you are, with His Kingdom becoming your everyday experience. You will receive practical experience in areas such as engagement in prophecy, healing, power evangelism, deliverance, and more. Impact your city, transform your church and grow together with us right where you live, work, and have relationships! The North Jersey Vineyard Church is very committed to praying for the sick. If you have a physical need in your life, there are a variety of ways you can receive prayer. At all of our worship services, we always engage in “ministry time.” This is a designated time where you can meet with one of our trained prayer ministry team members for healing prayer. We give clear instructions at all of our services of how you can take advantage of this opportunity. With prayer being at the center of what we do, we have a variety of prayer opportunities at the North Jersey Vineyard. Click to learn more about our Prayer & Holy Spirit Ministries. Childcare is provided at each gathering, and we ask that all parents kindly contribute $5 toward childcare costs. To sign up for the next Marriage Enrichment Group, please email info@njvine.com or sign up on your connection card when you attend one of our weekend services.